Turn your porch into an outdoor room. Your home’s exterior is the first impression people see when coming over, driving or walking by so make it is as pleasant and inviting as can be. Here are some ShopRTO tips to make the best curb appeal you can. 1. Clear any clutter from your entry and lawn. Remove kids toys, garden hoses, sports equipment, etc. Leave the area nice, clear and clean. 2. If you have a big enough porch, add some furniture and make a nice sitting area. There are plenty of outdoor furniture that can sustain the elements and are easy to cover during those times. There is nothing better than having a chat, reading or just watching the cars roll by on a couch on your covered and furnished porch. 3. Add some lighting. A well lit porch and exterior makes for a pleasant setting. It is also good for security reasons. 4. Bring out some nice potted plants. When in doubt about home decorating, plant life is always a great way to start. 5. Liven up the windows with new shades, curtains or just a wipe of a towel and glass cleaner. 6. Cover that AC unit if it’s outside. Nothing uglier than a big ‘ol metal canister. Try bushes or a nice wooden enclosure. Make sure it’s subtle, though. You don’t want to make it worse by overdoing the ‘hiding’. These are just a few of the tips as the list can go on and on with landscaping, painting, driveway, etc. Just remember that the first thing you do after work is drive up to your home so make the end of your day the best with the best home front. If you live in seasonal climates where Summers are gorgeous and Winters are horrible then rent that outdoor furniture for the season. Saves you time and the hassles of upkeep. 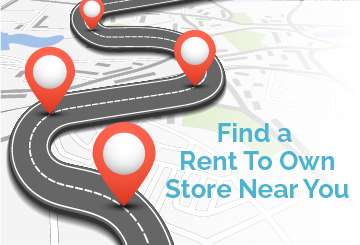 Many rent to own stores rent outdoor furniture so find the RTO store in your area to have them deliver, set up then pick it up when the weather calls for its return. Rent to own stores do not make your iced tea or popcorn for the outdoor relaxing but, who knows? It’s all about customer service. Another ShopRTO outdoor decorating tip.